through a single, integrated resource called ChartCo OneOcean. This means you spend less time on admin, allowing you to focus on providing the best possible service for owners and guests. OneOcean encompasses the entire suite of ChartCo’s navigation, compliance and shoreside monitoring applications: PassageManager, Regs4yachts and FleetManager in order to offer the highest levels of route planning, navigation management, shoreside operations and maritime regulations management. Through OneOcean, the time-consuming task of maintaining your vessel’s navigation outfit is managed quickly and efficiently by automating a wide range of weekly tasks, such as digital updates, as well giving clear indications of when and where action is required. 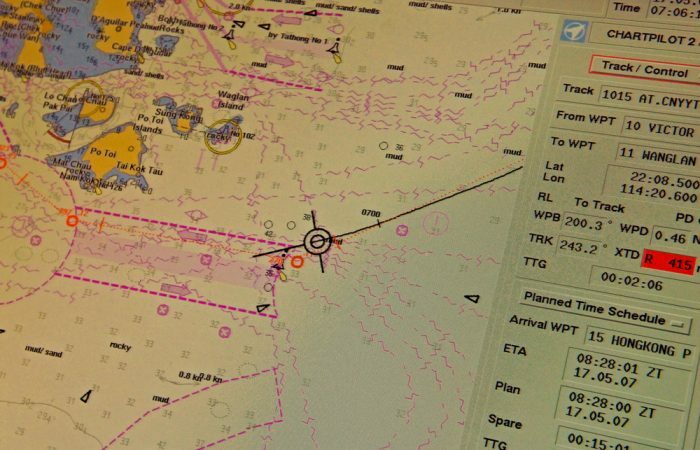 In addition to automatically updating digital products, the powerful route planning functionality notifies the user of chart updates and omissions in the yacht’s navigation suite. Missing products can be ordered directly from the platform, saving officers and crew the time-consuming task of doing this manually. Admiralty applications form an integral part of OneOcean making it easy for users to access them without having to jump from one application to another. This single platform has been designed to be user-friendly, making it easier to learn and eliminates the need to master multiple software tools. 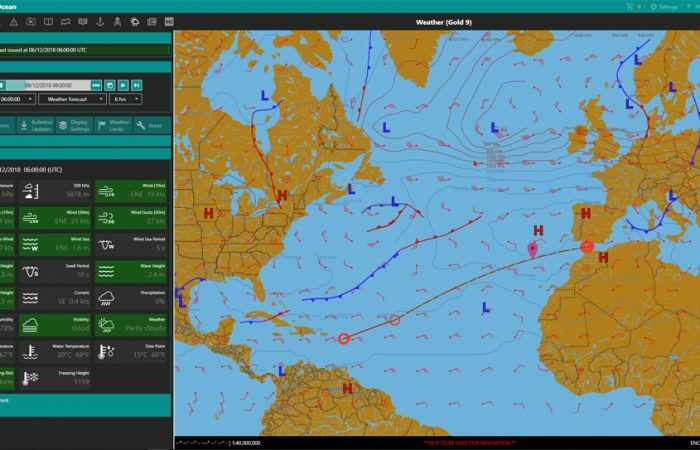 One aspect of significant interest to superyacht Captains and Chief Officers, is the integration of ChartCo’s new weather module. 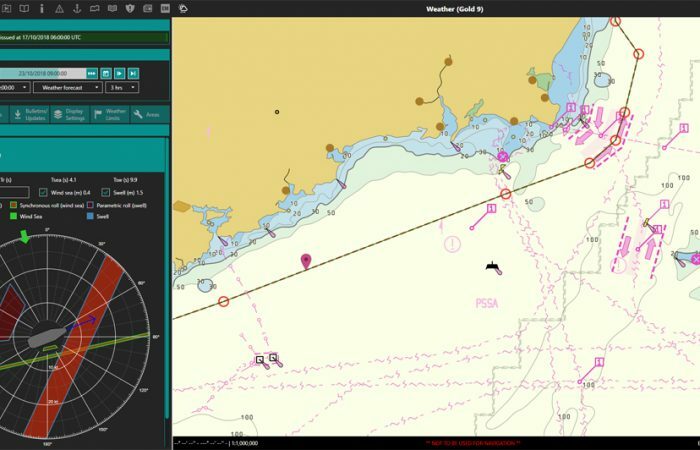 Providing the most accurate weather service available, it allows bridge crew to view weather data overlaid onto Electronic Navigation Charts (ENCs). OneOcean weather calculates and recalculates optimum routes and anticipates oncoming weather and sea conditions to enable yachts to safely navigate the globe with minimal fuel consumption and emissions. Effectively, Captains can see in advance a comprehensive weather forecast for the entire passage, from origin to destination. With a range of configurable weather profiles, yachts can set the different parameters for different conditions, guests on, or guests off for example. What sets OneOcean weather apart is, because it is integrated, the best route can be achieved according to specific needs, such as the best arrival time or the avoidance of specific weather parameters. A range of optimised routes can be reviewed side-by¬side to make the best possible decision on which route to take and the entire route forecast can be viewed without having to export the route to another application. With the future likely to bring further environmental controls and requirements for the superyacht industry, ChartCo’s EnviroManager application is another valuable tool to help ensure worldwide environmental compliance. 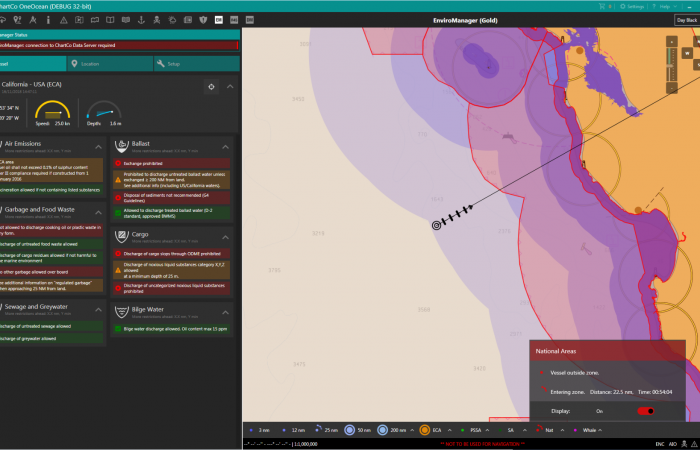 EnviroManager, developed to meet the environmental shipping regulations set by the IMO under its MARPOL convention, consolidates international regulations and local regulations, drastically reducing the risk of errors which can occur when calculating distances from shore. With reputations, not to mention charter revenues at stake, yachts cannot afford to be caught out by, at times, confusing environmental regulations. Having listened carefully to advice from crews about how to improve our service before developing OneOcean, we are proud of what we have achieved. The powerful OneOcean platform makes life simpler for crew with the ability to access a complete range of navigation and compliance modules, all in one place. Our dedicated superyacht team spends time really getting to know each boat’s requirements, so we can deliver a high-quality, personalised service, tailored to specific needs and backed up by expert ChartCo support, available 24/7.